As far as Redd and Ray, the obvious differences were health and shooting percentage. And that problem remains. I thought the Wizards would make strides this year, but they are erratic and weak on D and on the bench. But they still scare me a little. Yi is not on their roster, I wonder where he is. T Mac is better at going to the rim, but Dunleavy has more years left. Slight edge to Mac. Marvin looks good so far for the Hawks. Rad and Pargo more great pickups. Also couldn’t help noticing in the Hawks-Wiz game how good Javale McGee is getting. He’s probably thinking he’s going to lead the league in blocked shots this season. Bogut will have his hands full tonight. Ray’s game? It would have put the clamp on the abominable Michael Redd, mainly. When the Bucks began to win without Ray in 2004, there were many, many Bucks fans who believed we were better off without him and that, while they didn’t like the trade, they thought Karl at least had the right idea on moving him. But that Redd-in-control offense was painful basketball to watch. Joe Smith and Toni Kukoc were too kind — I thought they could have done more to dictate how their team played. The rest of the “what ifs” would take a day to sort out. I caught some of the Hawks-Wizards game (league pass free trial). The Hawks will still be at the mercy of teams that play big against them, which bodes well for the Bucks. But they’re playing more like a team at this early stage, and playing smarter too. T-Mac looks great, doing the same kind of damage he did against the Bucks last season, and Josh looks interested in what’s going on. No Hinrich for now, but the addition of him last year and beating the Magic in the playoffs, then adding another basketball-genius veteran in T-Mac seems to have done wonders for the Hawks. Who would you rather have, Mike Dunleavy or T-Mac? 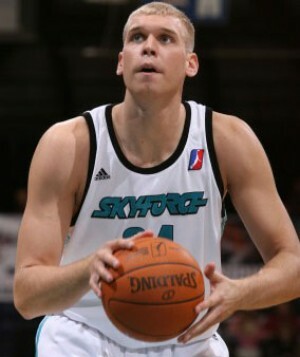 Being a 7 footer in the NBA is like being a left handed pitcher in baseball. You will have a job. Your Celtic post and the Suns signing Redd reminds me again of a few years back when they were both free agents and the Bucks were deciding who to try to sign. Never mind that horrific trade, what would Ray’s perimeter game have done for the Bucks offense? As far as other teams, the Hawks look good with their deep bench. No Crawford, but more players contributing. I was one that wanted T Mac. Clippers with Blake Griffin and DeAndre Jordan look small even against the Spurs and Tim Duncan and DeJuan Blair, and now Tiago Splitter in for duncan, Not as small as they looked against Bynum and Gasol in preseason, but they still look undersized. Splitter and Blair just ripped a rebound away from Jordan and Griffin and Blair muscled it in. Another missed rebound by the Clippers in the final seconds of the 1st quarter. Griffin needs more help than Jordan underneath. I can see why they reportedly went after Przy right after they traded Kaman. In addition to the above Sanders-Gooden reasons for not signing Pryz, the competition might be too tough for the Bucks anyway . Six blocked shots in 16 minutes for Jermaine O’Neal’s backup. But Marquis Daniels and Brandon Bass shot too poorly (7-24 combined) to make a dent in Hornets lead during Stiemsma-time. Good run for a while, but the Stiemsma-Bass bench crusade fell short at the end of the third, beginning of the fourth. The Celtics are looking at an 0-3 start.